In 1974 I moved back from Bracknell, where I had been working since 1971 to the outskirts of London, buying a small Victorian house, built as agricultural worker’s house, in Staines, one of a row of 6 properties split by narrow passages into three semi-detached houses. Staines is inside the M25, probably the best definition of Greater London, but our area is the only part of Middlesex not to be included in a London borough in 1965. Thanks to the objections of local Conservatives, particularly from the posher parts of the area we were delivered out of the London Borough of Hounslow, where Staines had been placed and obviously belonged and handed over to Surrey, across the River Thames, with whom Staines had very little in common and which still hasn’t quite accepted us, becoming the borough of Spelthorne. It was a decision based more on a snobbish disdain than political nous, as had the area been included, Hounslow would almost certainly have become a Conservative majority borough. We moved to be closer to London, not for the benefit of my photography, but because my wife was then working at the British Library, then inside the British Museum. We needed still to be on the Reading line for me to travel to work in Bracknell, and had found nothing in Twickenham or Richmond we could afford, and the next station on the service at that time was Staines. We moved in some time in August. After the move I was kept busy, painting walls and making small repairs and improvements inside the house, as well as digging up the extensive remains of the concrete floor of the former piggery a few inches below the large nettle patch in the garden. But I suspect I may have taken a day off during the October for the walk. The pictures are something of a tourist view of London – and rather more so including some of the pictures I’ve not thought worth putting on-line, but obviously from a long walk carefully planned – at least in outline – before the event. I wrote a short text to go with the pictures when I first put these online a few years ago, and here is most of it (with a few minor corrections.) You can see the other pictures not included here on my London Photographs site. 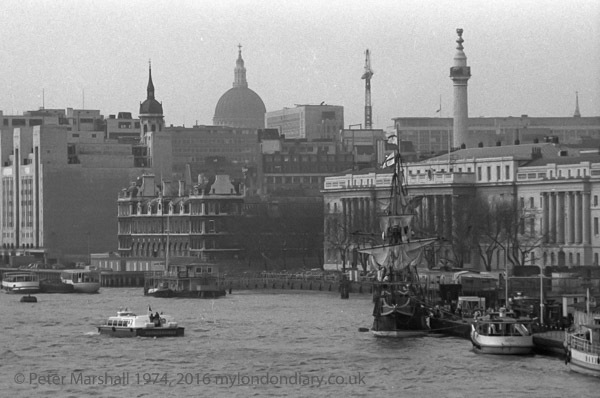 The Golden Hinde II seen moored in some images was launched in Appledore in April 1973, and came to London from Devon before her ‘maiden voyage’ in late 1974 – with a crowd here queuing to visit her. 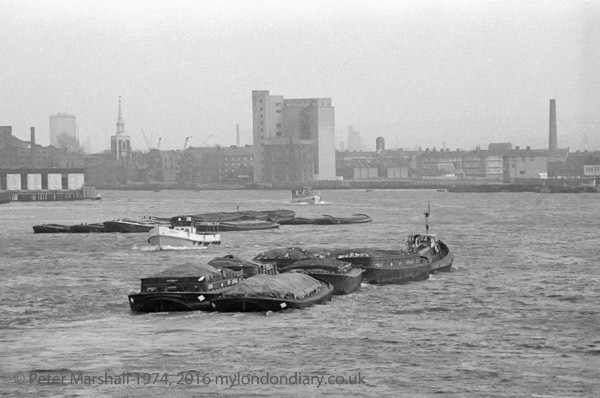 I think the ship arrived at Tower Pier in London in September and left the following month to sail to San Francisco, making a number of trips to various countries before becoming a tourist attraction on the opposite bank of the river in St Mary Overie Dock. They were probably made using a Zenith B, for which I had the standard 58mm f2 lens along with a Russian telephoto, though I also owned an Olympus 35SP, possibly the best fixed lens rangefinder camera ever made, with a superb 42mm f1.7 lens. 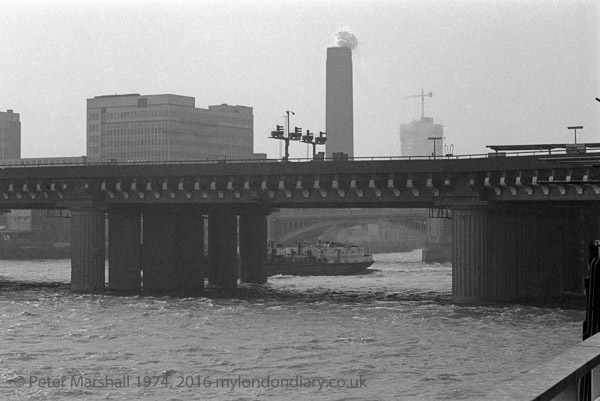 I can recall little of that day even with the aid of the contact sheets, but I appear to have started taking pictures from London Bridge (probably having taken a train to the station there from Waterloo East) before making my way along the south bank to Tower Bridge, then crossing that to St Katharine’s Dock beofre wandering back through the city along the north bank to St Pauls Cathedral and on along Fleet St to Trafalgar Square, then going back to the Thames and the Albert Embankment, probably on my way back to Waterloo Station. I took remarkably few pictures – 49 in all, on two Tri-X 36 exposure rolls. About half are shown here; a few of the images – of St Paul’s and in Trafalgar Square hold little or no interest, but most of the rest have at least some details. It’s surprising to look at some and remember how much has changed. 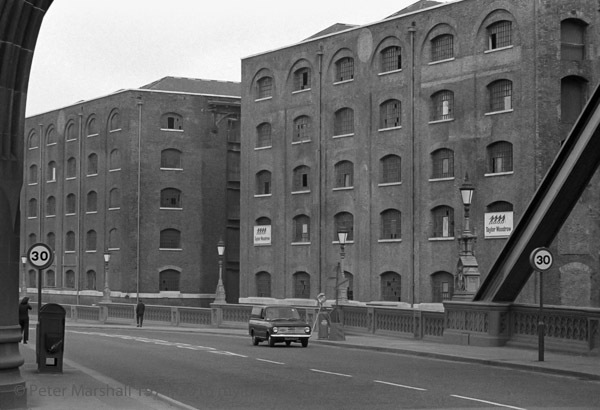 There were then no walkways beside the river on either bank in the City or opposite in Southwark, with only short lengths accessible. 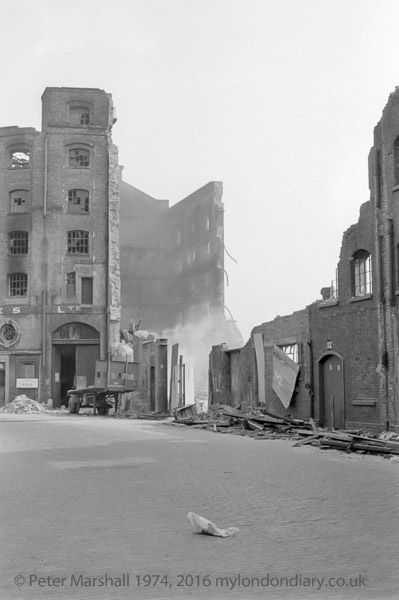 Many of the former industrial buildings have now been replaced by large office blocks, and in one image, smoke emerges from the towering chimney of the Bankside Power Station. Of least interest are the more touristic pictures – such as those of the Tower of London. 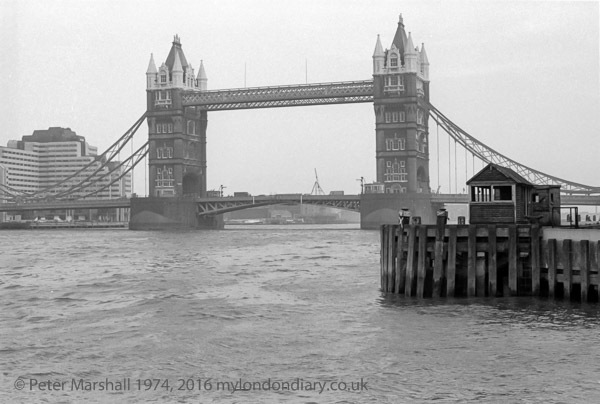 This entry was posted on Saturday, January 26th, 2019 at 09:33 am and is filed under LondonPhotos, My Own Work. You can follow any responses to this entry through the RSS 2.0 feed. You can leave a response, or trackback from your own site.